Mahindra XUV500’s success for Mahindra and Mahindra has been more than expected and the overwhelming response has led to closing of booking within few weeks after the launch of XUV5OO. One of the major reasons for the success of XUV5OO is the aggressive pricing, the price at which no competitor SUV or Crossover is providing the set of features which XUV5OO offers. Since the prices at launch were introductory and the sales picked up instantly, it was quite clear that a price increase will come up soon. The bookings for the XUV5OO will re-open n January 2012 and effective from 1 Jan 2012, the prices of the XUV will go up between Rs. 30,000 to Rs. 55,000. The customers who have already made their bookings and the delivery of their car is pending after 1 Jan 2011 will also have to bear the burnt of the price increase. But as a courtesy to provide benefits to customers who made early bookings, the only 50% of the price hike will be applicable for such customers. 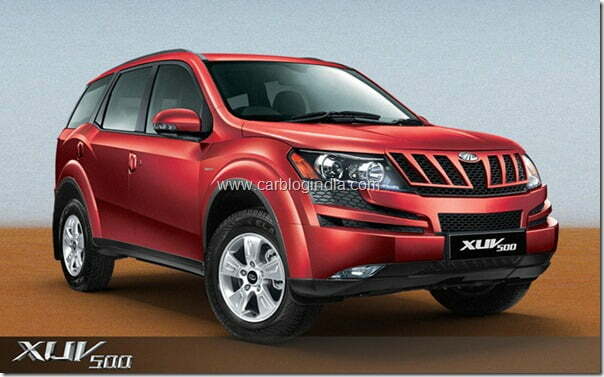 Mahindra XUV500 W6 4×2 Price will be Rs. 30,000 more than earlier price of Rs. 10.80. It now costs Rs. 11.10 Lakhs. Mahindra XUV500 W8 4×2 Price will be Rs. 50,000 more than earlier price of Rs. 11.95. It now costs Rs. 12.45 Lakhs. Mahindra XUV500 W8 4×4 Price will be Rs. 55,000 more than earlier price of Rs. 12.88. It now costs Rs. 13.43 Lakhs. Mahindra XUV500 W6 4×2 Price will be Rs. 15,000 more than earlier price of Rs. 10.80. It now costs Rs. 10.95 Lakhs. Mahindra XUV500 W8 4×2 Price will be Rs. 25,000 more than earlier price of Rs. 11.95. It now costs Rs. 12.20 Lakhs. Mahindra XUV500 W8 4×4 Price will be Rs. 27,500 more than earlier price of Rs. 12.88. It now costs Rs. 13.16 Lakhs.